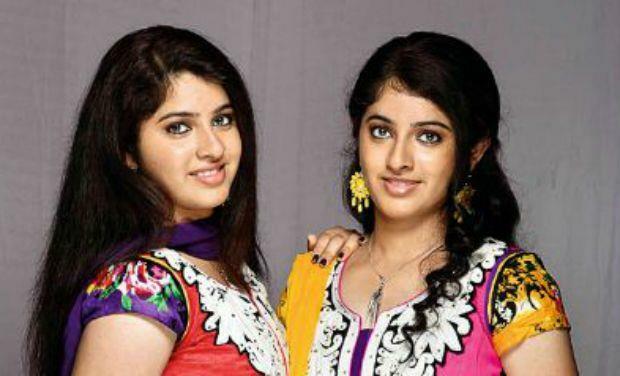 Twins Aina and Aima are the new acting sensations in the Malayalam movie industry. Both hail from Dubai though they have their ancestral roots in God's own country. They are making their acting debut in the Malayalam language film Love and Love Only. Before coming into the film world, they gave dancing performances in various venues. They are accustomed to both Indian and Western style of dancing. According to the director of the movie Manu Kannandhanam, both the girls are doing their jobs well in the movie. One of the twin sisters has an interest in Photography and camera. Hence, she wanted to take her passion as a career, rather than the profession of acting. The other wanted to continue in the film world as an accomplished actress. Twin girls Aina and Aima are born and brought up in Dubai. Their parents are settled there. They had their formal education in Dubai itself. After successfully completing the formal education, they joined a reputed school in Dubai to complete their higher secondary school education. During their school days, both the girls were interested in dance. At their tender age, they took up their training in both Indian and Western forms of dances. When they completed their higher secondary education, they became confident enough in performing before the selected audience. They came to the field of acting by sheer stroke of luck. Reputed director Manu Kannandhanam was looking for real twin girls for his new movie titled Love and Love Only. He was searching all around the state to find the girls he was looking for. During that time, he happened to visit a place where the talented girls Aina and Aima were performing on a stage. Since he was having a soft corner for different art forms, he happened to stay back and watch the performance of these girls. He was so impressed with their performances that he gave them the chances for acting in his upcoming movie. For this purpose, he contacted their parents. After having read the script of the movie, their parents decided to talk to the director. The negotiation successfully ended and the deal was clinched for the girls. The girls accompanied their parents to their native place in Kerala. After a brief period of stay at their ancestral home, they embarked on their journey to the set where the shooting had already begun. Though they started their career in acting, they did not want to put a break on their education. Both of them wanted to complete their graduation first and look ahead in their professional life. In the Malayalam film industry, Aima and Aina are like two peas in a pod. The twins will make their debut in Mollywood film 'Dooram'. This film will be directed by Manu Kannandhanam. It is a suspense filled humorous movie. In this movie, Aina and Aima are going to be sharing the silver screen with Maqbool Salmaan, Shine Tom Chacko, Bhagath Manuel, Saikumar, Ambika Mohan and Sooraj Venjaranmoodu. The music for the movie will be scored by Muhammed Niswan. For Malayalam movie industry, it would be a first of its kind with the twins making their debut as heroines in the film. Hence, both Aima and Aina are very much excited about their offer and are basking in the new-found glory. Speaking about casting the Dubai -based twins in his film, the movie director Manu explained that the story demanded the presence of twins and he insisted on getting real-life twins to caste the main roles in the movie. He further added that they were performing really well and he was happy with the way they were picking up the art of acting in their maiden venture. On the occasion of the beginning of shooting, Aina said that she and her twin sister were classical dancers with knowledge about western style of dancing. She further added that the profession of acting was new to them and they were quickly learning the art to put up the best performance in the movie. She thanked the crew members at the shooting location for giving the much needed support for them. She was of the opinion that their native fluency in Malayalam had helped them to mingle nicely with the crew members at the shooting location. Due to the same reason, they were able to get some helping tips on acting from the senior artists at the shooting location. Though Aina and Aima were far away from their home, they were comfortable working together. Speaking about the support they lend to each other, Aina disclosed that the presence of her twin sister was a source of comfort and support for her. On their acting, she added that they cease to become siblings in the movie set and transform themselves to the characters of the movie. Though their looks mirror each other, outlook and opinions of Aina and Aima are very dissimilar. One wanted to pursue her career in acting and the other wanted to build her career up in Photography. Though Aima was very candid in saying that the acting was an OK experience for her, she wanted to become an expert photographer and excel in her professional life. She further said that thought of acting never came across her mind and never felt any like or passion for it. Before choosing her career, she wanted to finish her education and earn a degree. Aina on the other hand very much liked the acting profession and began to like every movement of her stay in the movie set. Like her twin sister, she also wanted to finish her education first. Till then, she wanted to enjoy the worlds of cinema and education together like her sister. Aina and Aima are the new acting sensations in the Malayalam movie industry. They entered into the field of acting by donning the lead roles in the Malayalam language movie Love and Love Only. When they got the offer, they were still studying for their degree in Dubai. Both sisters are trained in Indian classical and Western dance forms. To some extent, their knowledge in dance has contributed to their success in acting. Aima wanted to become a successful photographer in her professional life. On the other hand, the Aina wanted to continue her good work in the film industry as an accomplished actress. However, both the sisters wanted to continue their education and finish their degrees first. They also would like to continue their passion for dancing whenever they get some leisure time in between the hectic schedules.